The Zwicky silk thread company (of Wallisellen in Canton Zürich, Switzerland), most recently visited in my posting on the 19th, “A Swiss thread”. Apparently, in the 1940s, the company had an office in Paris, with these imposing doors. I see that the thread-making part of the company was merged in 2001 into the A&E Gütermann textile firm of Freiburg im Breisgau, Germany (in the Black Forest, north of Basel, Switzerland and just west of the Rhine (and France)). Meanwhile, as I reported in my 9/12/17 posting “Cat on a silken thread”, the company has branched out into a construction and realty firm at the Wallisellen site. In this blog, I will ruminate, reminisce, and occasionally rant about all things Paris. I focus on the cultural, culinary, social, philosophical and, of course, the sheer joy of living in Paris. Each article has a teaser of a photograph and a first paragraph. When it catches your interest, simply click on it to read the entire article. I welcome comments, conversation, and ideas. 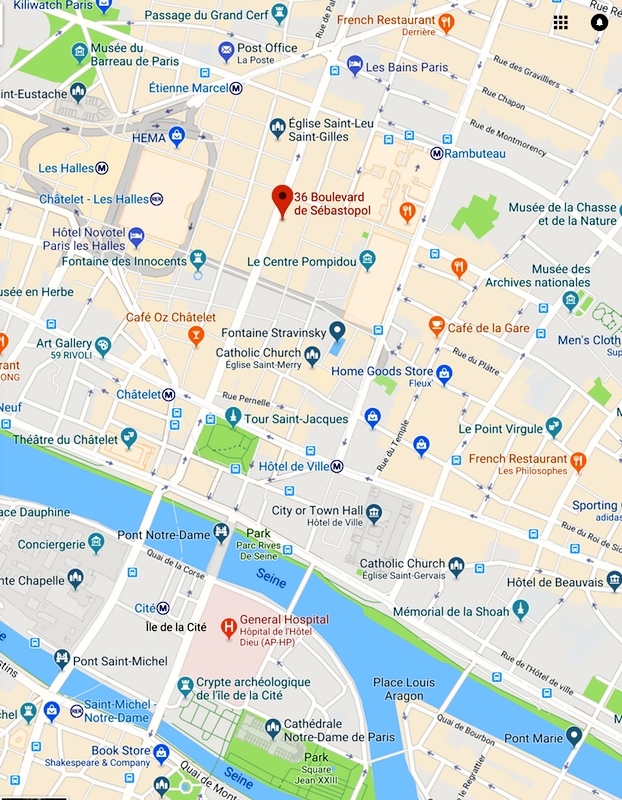 On small, nearly hidden Paris streets as well as on the grands boulevards, the visitor will see signs for businesses that have vanished. 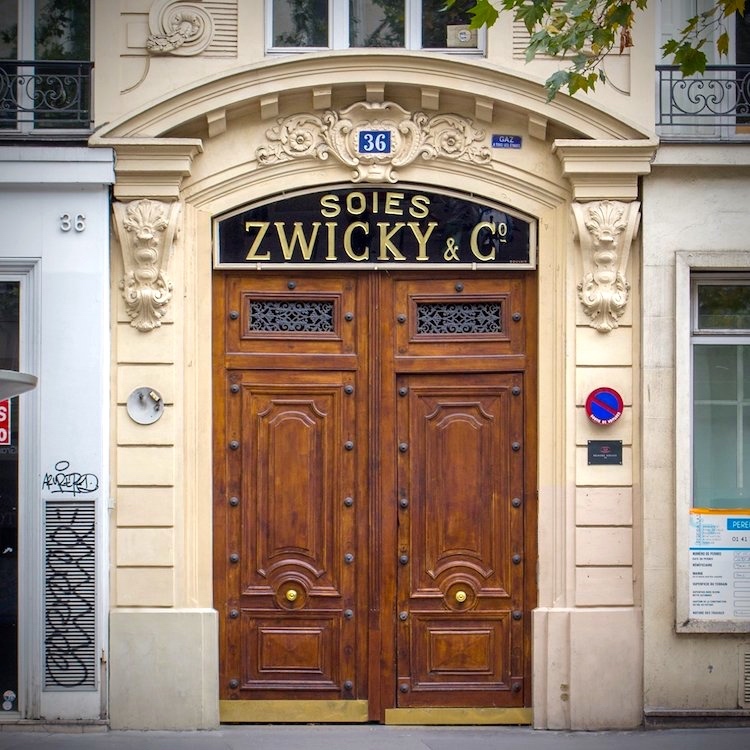 … This stunning gold on black sign, at 36, Boulevard Sébastopol, simply proclaims the name of the company, presumably the family name Zwicky; and its product: silks. The tiny blue sign to the right of the street number proclaims gaz à tous l’étages. Every floor of the building would have been lit and heated by gas. For the most part, the ground floor exteriors of the buildings on the street have been reconstructed, while the upper floor exteriors are (elegantly) untouched. But one part of the ground floor at 36 has been preserved (saving Soies Zwicky & Co. for us), while the adjacent building has had its upper-floor windows graffitied. The most common tag on the street seems to be the gang tag CKT (clichy krime time, Clichy being a reference to the Place (de) Clichy in northwest Paris). 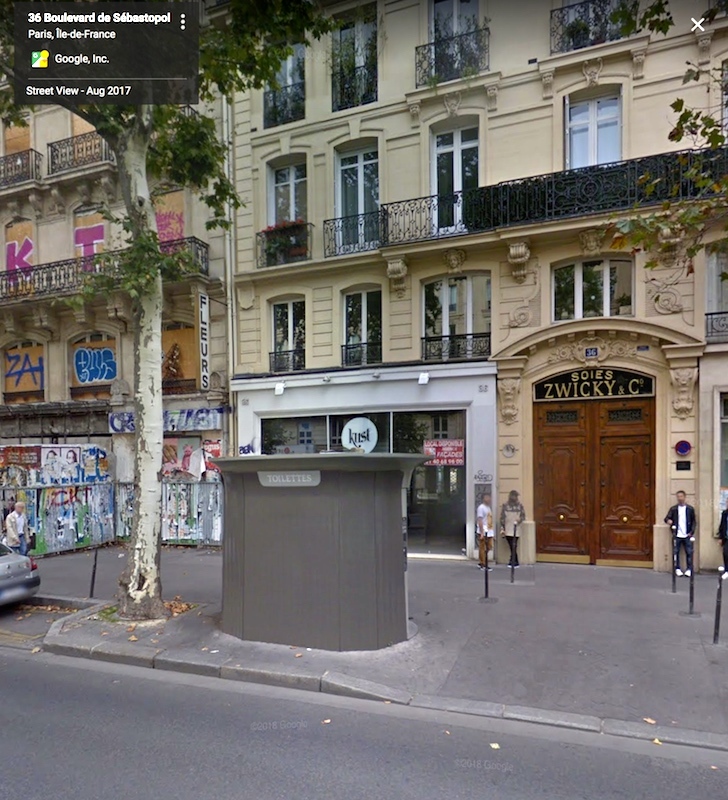 The area around the building looks a bit iffy in the Google street views, but then I know nothing about this neighborhood of Paris. This entry was posted on June 24, 2018 at 5:37 am and is filed under Zwickys. You can follow any responses to this entry through the RSS 2.0 feed. You can leave a response, or trackback from your own site. Yes, the title ended up being a play on the title of Joni Mitchell’s song “A Free Man in Paris”. By the way: The building was used as sales office for Zwicky sewing threads until 2000 and is still owned by the Zwicky Family. Many thanks. I was having trouble finding anything about the history of the building.